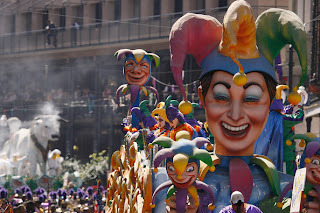 Mardi Gras is a massive carnival in New Orleans is always eagerly awaited. At the carnival, all activities in the city stopped, streets closed to cars and people ready to party with the best costume. You can come in costume, or play music while you join the group or simply enjoy the festive atmosphere on the the day. According www.mardigrasneworleans.com, Mardi Gras in New Orleans has been around since 1730, but was without form, but a carnival dance. Carnival Mardi Gras attendance in 1830 and more crowded after the carnival committee. In 1872, the carnival is coupled with the presence of a carnival king named Rex, and he appeared at the beginning of the carnival. Mardi Gras has three distinctive colors of gold, purple and green. In this carnival, many beads will be colorful to be thrown around the city by carnival participants. There are also interesting is thrown doubloon, or coins bearing the king's face. These colorful coins will be thrown by Rex, the king of carnival, at the start of carnival. If you are lucky to get this coin, keep well because it is believed to be good luck charms. 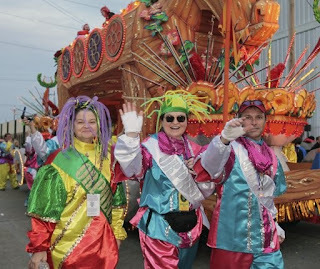 In addition to the beads and colorful coins, Mardi Gras also has another tradition that the king of king cake or pie. Cake that has been around since the first is a typical cake in various events, including Mardi Gras. This cake is made of a simple large donut bread contains a little doll baby. If you get a piece containing a baby doll, then you are considered lucky and will host at event next king cake. On Mardi Gras king cake is coupled with a sprinkling of colored sugar on it and the typical colors of Mardi Gras 3. In the center of cake circle is filled with colorful beads. Her little baby doll tucked at around the bead. In addition to luck, you can find a lot of fun at this carnival. Just imagine, the whole city filled parade around with a systematic ready. Every parade has a unique individual. You will not hold if just to watch it, definitely want to come dressed up and enliven the festive event. Feathers, beads, face paint and super unique clothing you'll meet throughout the city. Mardi Gras also has a unique thing that is Mardi Gras Indians. Starting from the slavery of blacks experienced, Mardi Gras Indians were finally formed. Because of a marginal group, blacks were not able to follow the parade. Not to be outdone, the black man Indians call their group and begin to join the parade. Interestingly, their existence is difficult to guess because it's unpredictable and mysterious costume. Although starting from a sense of hurt that eliminated the black group is not harmful to the course of the carnival. This is due to the presence of blacks had begun well received there.